We began homeschooling years ago when public school wasn’t able to protect my kids from bullies. I was relieved to have found a safe place for my kids to be as they completed their education, and slightly nauseous that I was the one to be teaching them. On one hand I was thrilled to spend more time with them, and on the other, terrified I’d never pee alone again. ?The simple truth is home schooling had been everything I thought it would be, and more, including never being alone. I addition to being just a wife and a Mom, I’ve added teacher to the list. I’ve learned a lot and have taught a lot. II worried about socialization when I shouldn’t have worried, because honestly, we are more social now than we ever were. We joined a co-op where my kids (and i!) met and made friends. I spend a lot of time in the car driving from one side of the state to the other for enrichment classes. I’m up late reading for assignments I have to teach the next day. I added teaching everyday life skills, think cooking cleaning, banking, all the adulating stuff to our lessons, so everything I do is with the kids. Everything. I absolutely love being with my kids all the time, well, most of the time. It seems that I am always doing something for co-op or kids or the house and it became overwhelming until I realized the problem. I was doing for everyone else, and not for me, and it was killing me. I had a mini breakdown and scared the crap out of my husband until I got him to understand I needed some “Me Time” , too. I started making some small but oh, so important changes that have made all the difference. ?I meet with a friend at least once a month for a long breakfast date. My BFF Kim and I pick our favorite diner where they don’t care that we spend a few hours in a quiet corner and we talk and talk. I try to host a get together at least once every 8 weeks. Nothing fancy, it’s a potluck where I do not super clean but just simply straighten up. It’s all paper plates and quick clean up. It’s super low key, and fun. I grocery shop by myself. I used to bring the kids with me, but they cost me so much money and peace, I’m one of those people that actually like shopping and it makes me happy to pick out the perfect foods for my family. I go to bed 30 minutes before my husband. If I am reading, watching tv, or just sitting and thinking, I take time to decompress and gather myself before I move from Mom to Wife. I need a few minutes of just being me! 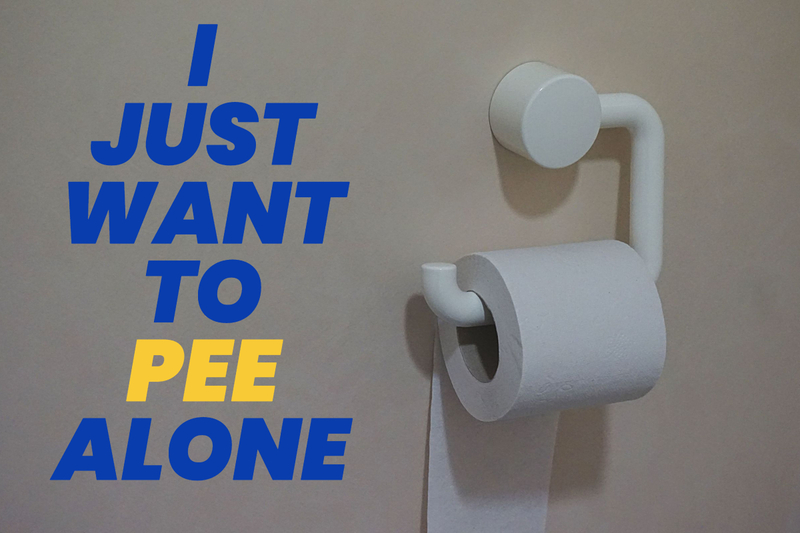 I pee by myself. No one is allowed to interrupt me unless there is blood or a fire. None of these are huge changes, but they were huge TO ME. They gave me a sense of power and control over my life again, when sometimes being at home with kids can seem like a total loss of control. And I finally get to pee by myself, unless I’m stranded with no paper, then I yell for someone to help me and they tell me that they’re not allowed near my bathroom. Then I have to break another rule, but it’s still under my control.